Safestyle UK has announced the lucky winner of the February draw of the Diamond Account Club. When I got the call to notify that we'd won the prize draw I just couldn't believe it. When I looked at the Safestyle website and saw our names up there as the winners the fantastic news began to sink in. It really couldn't have come at a better time, especially with the way things are at the moment. It is an incredible feeling and we are very grateful to Safestyle UK. Safestyle UK's Diamond Account Club quarterly prize draw continues into its second year with Mr Darren Watts and partner Tammy Gordon of Hampshire becoming the first winners of 2009, having their massive £5,892 account balance for installation of Safestyle's energy-saving double glazing paid off in full. 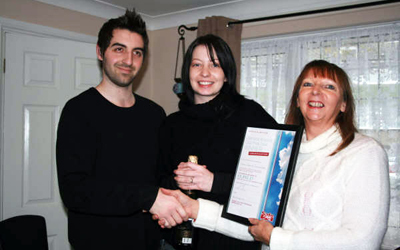 The lucky couple are now the fifth winners of The Safestyle Diamond Account Club which was created in 2007 to provide additional benefits to people purchasing their double glazing using Safestyle UK's flexible finance package. The Club includes a quarterly prize draw in which winners are entitled to have their entire outstanding payment balance paid off. At this difficult economic time, when much of the country are facing the doom and gloom of recession, Safestyle UK are very proud to be able to bring positive news to their customers and offer them valuable prizes and benefits. Safestyle have long been at the forefront of the glazing industry, developing the latest in glazing technology and providing the nation with cutting edge energy saving double glazing at an affordable price. The latest Safestyle prize draw took place at the beginning of February, with Mr Watts and Miss Gordon emerging as the lucky winners and having their balance of £5,892 written off. A delighted Tammy commented, "When I got the call to notify that we'd won the prize draw I just couldn't believe it. When I looked at the Safestyle website and saw our names up there as the winners the fantastic news began to sink in. It really couldn't have come at a better time, especially with the way things are at the moment. It is an incredible feeling and we are very grateful to Safestyle UK." While the Diamond Account Club qualifies members to automatic entry into the prize draw, it also incorporates special offers and services from partner companies, providing members with fantastic discounts on various goods, from holidays to new window blinds. This helps make Safestyle's home improvement finance package even more beneficial to its customers. Laura Middlemas, a Safestyle UK marketing executive, commented: "This is a very substantial prize to win and the largest sum of all the prize draws to date, it's fantastic that is has come at this time, sending a really positive message to all our customers and potential customers. Look out for the next prize draw which takes place on May 1st." Safestyle UK Limited is the country's largest independent retailer of high quality, competitively priced and environmentally friendly PVCu windows and doors. Since its inception in 1992 the Group has continued to expand in tune with customer needs and now has more than 40 branches across the country from the South West to the North East serviced by an in-house transport fleet. The Group incorporates two specialist companies catering for manufacture and retail. The Safestyle retail arm is synonymous with quality and affordability and installs £2m worth of domestic windows and door frames every week on the back of top celebrity-fronted television and radio advertisement campaigns. The company also has a manufacturing arm with a state-of-the-art factory at Wombwell, near Barnsley in South Yorkshire. It produces up to 10,000 quality assured frames per week and is the area's largest single employer. In line with its CSR policy and in response to environmental pressure Safestyle has, since January 2008, manufactured and installed energy rated windows as standard.